Join the discussion on our forums! 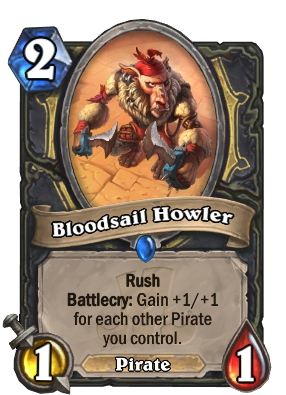 Come discuss Bloodsail Howler over in our dedicated Bloodsail Howler discussion topic. I want to hear AVAST YE DOOKERS! Pirates are cheap enough that it should be easy to buff this guy. Good card in any Pirate Rogue I'm sure, especially if it's an Even archetype. It's bad pull from Captain Hooktusk, but, if you carry few bounce effects, like classic Shadowstep, you can fix that issue. It's okay card, at max 7/7, but you're likely just get it as 3/3 in general, unless you play it after tusk or otherwise get lucky or unlucky. Overall, i say it should be decent but fair card. Not too aggro, not too control. Bad when summoned by Captain Hooktusk, has synergy when played from hand after Tusk. Well Witchwood Piper might be played in Even Pirate Rogue! That is a combo, but very poor tempo for a Pirate deck. Pretty okay. i guess it will be 3/3 or 4/4 for the most time which wouldn't be that bad but if you pull of some crazy spawn more pirates combo on later turns it might become a threat. Will try.